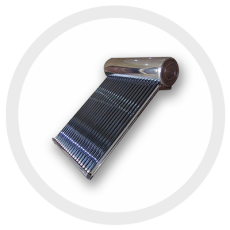 Why a solar hot tub heater? Because hot tubs, swim spas, and pools are expensive to heat and they use large amounts of electricity. To put it simply, this is the least expensive way to heat your hot tub. The Sunbank Solar Hot Tub Kit produces more than 25,000 BTU on a sunny day and transfers that heat into your tub or spa. In places with high electricity rates the kit can save you as much as $900 dollars per year. This is a simple retrofit and can be installed in one day. The kit comes with all the parts you need to do the installation. You will need to mount the collector, assemble the plumbing, and fill your closed loop. Sunbank will supply you with an installation manual that lists the tools you need, and either you or your local handyman can do the installation. 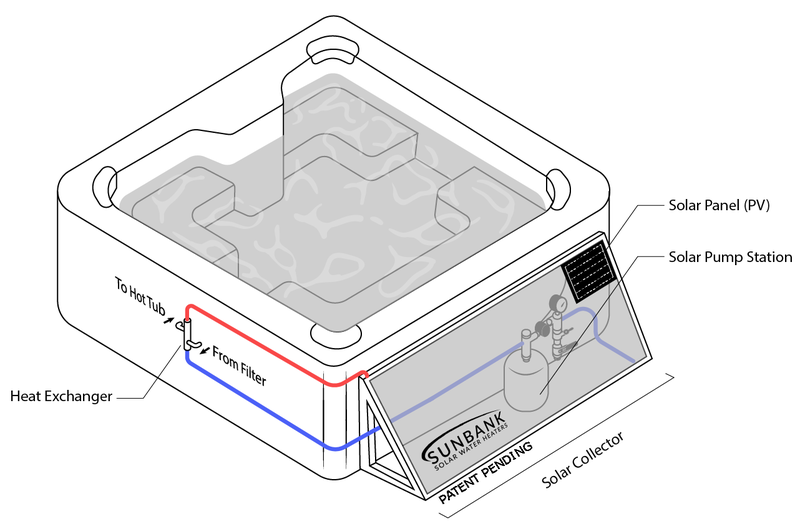 We’ve designed various options so that our solar hot tub kit can integrate with every hot tub, swim spa, and pool there is. Our basic kit comes with either the drop in or integrated heat exchanger option. Which one is right for you will depend on your hot tub and your preference. The integrated heat exchanger works with tubs that have a continuous (24 hr) filter pump made popular by the Hot Springs Spa brand and now common in most hot tubs. The integrated heat exchanger requires cutting into this line and installing the heat exchanger. For those not interested in that, there is the drop in coil heat exchanger which requires no modification to your existing hot tub. If you live in a freezing climate we have you covered with our freeze protection package. We include glycol (+$75) with your kit that protects all of the components of your hot tub kit from freezing weather and allows you to get heat from your kit even on cold winter days. For those of you who live in places with especially long winters, we can swap out the flat plate collector for a cold weather specialist – the evacuated tube collector (+$499) so that you can get more heat on cold days. No problem! Not everyone will be able to mount the solar collector right next to the hot tub. Let us know how far the collector will be from the tub when you’re ordering and we can make sure that you have enough tubing to cover the gap. You might want to mount the collector on your roof, a nearby fence, or the trellis over the hot tub. Let us know and we’ll help you design a system that works for you. Larger bodies of water require more heat and custom sizing. To help us help you, send us an email and tell us how large your pool or swim spa is (length x width), where you’re located, and what temperature you like to keep your water. We’ll run the numbers and suggest a system that will save you lots on that heating bill. Click the link below for a full screen version or use the widget to the right to tell us more. Tell us about your project and we’ll send you what you need to know.